Did you know that 80 percent of workers feel stressed on the job? That’s a lot of stress happening in offices across the world. While it can be normal to feel stressed out about your job, it can also have a lot of negative health effects. With the holiday season rolling around, stress can come into play. Shorter work weeks can play into the stressed-out feelings. Having a higher demand for products, or the end of the year reports can lead to feeling overwhelmed very quickly. Reducing the amount of stress at the office can lead to an overall happier life and more productivity at work. These simple to follow tips can help you eliminate stress at work and increase your motivation. Employees often think that the more time they work, the more work they will get done. In reality, taking frequent breaks at work can make you a better employee and improve your productivity. Getting away from your work also lets your mind take a break, which can help when you’re stressed out about a project. Working for too long can cause mistakes to happen. If you are tired, you might not catch them until it is too late to fix them. But taking a break now and again to refocus your energy and refresh your mind can help reduce brain overloads, and keep you sharp and focused on the task at hand. Our attention spans are only so long, which is why when we try to work for more than three or four hours at a time our eyes start to gloss over. By setting an alarm on your phone to help you remember to get up from your work and stretch or take a walk, you can become more productive while reducing your stress. Even walking away to get a drink of water, or deliver some paperwork to another colleague can help to wake your body back up. Adding exercise to your daily work routine can help to alleviate stressed feelings as well. 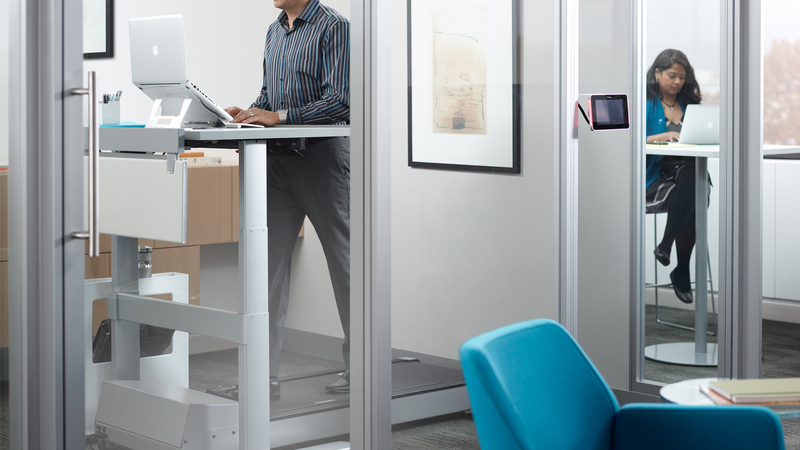 By using the Walkstation from Steelcase, you can walk away those crazy feelings! Walking can help to increase endorphins in your body, which leads to happier thoughts. The Walkstation allows for movement, with a treadmill attached to the bottom of the station, allowing you to power walk through those phone calls, or end of the year reports. Go from standing to walking with ease! Now that you know how to be as efficient as possible at work, it’s time to think about delegating. So many employees are afraid of delegating because they think it might make them look bad or lazy. When in reality, the less work you have to do yourself, the better the quality of work you can produce. Incorporating art and plants into your work space can also help to alleviate stress at work. Having things that bring joy and peace into your work space can make you more productive. Place a vase of flowers on your desk. Personalizing your work area can go a long way to keeping the overloaded feeling at bay. Most employers value quality over quantity, and overloading yourself with too much work is not going to help you with that. Taking some of the weight off your shoulders at the office can give you more time to put in your best effort and significantly reduce your workplace stress.Remember, it is okay to ask for help! You have vacation time for a reason, so make sure you use it. You need to take a real break from the chaos of your office every once in a while to let your mind rest and reconnect with the things that matter the most. When you use your vacation time, don’t be tempted to bring along your phone or laptop home or to the hotel. Leave your work in the office and truly enjoy yourself. When you return from your vacation, you might be surprised at how rested and productive you will be. The last tip for reducing stress levels at work is making sure you carve out time for yourself. Don’t take work home with you if you can help it, and leave your weekends open for pursuing your passions and catching up on your hobbies. Your brain needs the break as much as your body. Let your mind recoup before heading back to the office on Monday.